WWW, April 2014 - Serious DJ chanting by Tappa Zukie, Prince Fari, U Brown, Dillinger and Trinity. Essential singers , too: Michael Prophet, Linvall Thompson, Prince Alla, Junior Ross, Cornell Campbell, Horace Andy as well as Yabby You and the Prophets (who gave the title to this chapter). That is, next to the necessary heavyweight DUB mixing by none other than King Tubby, Prince Jammy, Ernest Hoo Kim and others. This is the second chapter of Radio Dubroom 2014! 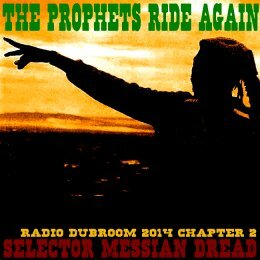 The set starts off with an introduction DUB carrying the vocals of Michael Prophet. Linvall Thompson continues to set the tone with an excellent Discomix, just before a vocal, DJ and DUB by Yabby You, the Prophets, Trinity and King Tubby's. Thunder and lightning! The second part is reserved for the DJ's. Roots and culture, chant it out and chant it loud loud: this is what Tappa Zukie, U Brown and other are doing and they are doing it on some heavyweight DUB fe true. Heavyweight DUB is the topic of the third part: steppers and one drop rhythms with thunderous bass lines and skillful manual DUB mixing. This is not old skool style, this is old skool! The last and fourth part of the set is a combination of singers doing their work and the DUB engineers doing the same: That's right: time for chapter and version, Discomixes, A and B sides combined. Horace Andy, Prine alla, Junior Ross and Cornell Campbell are there.